Some shock upsets and some great performances. 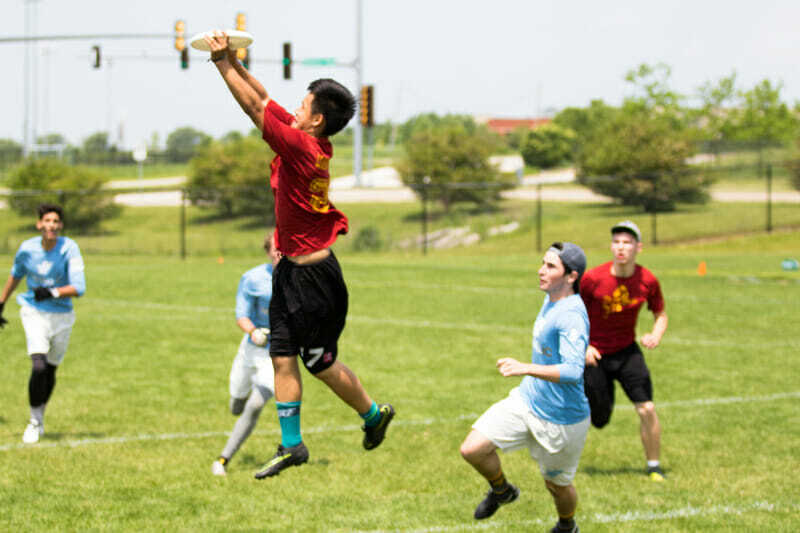 The inaugural edition of the High School National Invite is presented by Spin Ultimate. A nearly two hour lightning delay didn’t dampen the spirits of players on a tremendous day of ultimate at the inaugural High School National Invite. Here is a recap of the action on Saturday. Athleticism and fire fueled the day’s first big upset as No. 12 seeded Mason shocked No. 1 seeded Center Grove, blowing by them for the 13-7 win. Mason proved themselves immediately as a force to be reckoned with. In the second game of the day, Mason locked up the pool victory, thanks to a 13-8 win over Garfield. With the pool in hand, Mason was able to rest starters for the entirety of their final game. Led by Sion and Axel Amagi, Mason showed themselves as an athletic team at the top of the high school division. Holy Family Catholic Revolution fought their way through prequarters to match up with Mason on Sunday. In pool play, Revolution opened the day with a 13-9 victory over Chapel Hill. “It’s exciting to be here, and we understand the significance of this tournament,” said Holy Family coach Steve Conrad. A grinding team with a handful of tall players, HFC used a strong and intimidating zone to stifle opposing offenses. The zone helped HFC stick close to Lakeside, losing just 11-10. Against Iowa City, HFC made big plays early and ran away with the game, never allowing Iowa City to get a foothold. Finally, Holy Family took on a tough Fishers team in prequarters. Again, HFC was able to pull away early, jumping out to a 6-2 lead and never looking back. Garfield showed themselves to be a streaky team throughout Saturday. Despite showing inconsistency on offense at times, periods of excellence kept them competitive. In perhaps the toughest pool of the day, Garfield struggled. A slow start ended on a positive note as the team picked up a 14-12 win over Watchung Hills. Against top-level teams Center Grove and Mason, though, Garfield couldn’t keep up. After finishing third in the pool, Garfield found themselves in a prequarter matchup with Neuqua Valley. In a game of runs, Garfield made the last one — a 4-1 burst — to take the game 13-10. “We worked really hard [defensively] to get underneath our guys, and that helped us,” Garfield coach Rusty Brown said. Grady, after a sluggish start against Fishers, showed that they were worthy of one of the tournament’s top seeds, dominating their remaining games. In a largely back and forth game, Grady was able to squeak out a win over Fishers, 11-10. By spreading out the disc and getting touches and contributions from players all over the roster, Grady created an effective and efficient offense. With a handful of reliable players with disc skills on every line, Grady was able to work as a dangerous offense under almost any circumstance. Combine their effective offense with a tight zone defense packed with athletes, and Grady was able to roll through their last two games of the day. They have legitimate title aspirations. You couldn’t ask for a more contrasting style of play between Pool D winner Catholic and the two seed from Pool C, Cleveland. Catholic has been untouchable on their road to the quarterfinals. They all but locked up pool D with two blowout wins over Neuqua Valley and De Smet and easily won their final low stakes pool play game after South Eugene forfeited during the lightning delay. Catholic has been fueled by the play Matt Freeburgh but their depth showed throughout Saturday as they picked apart teams isolating cutters out of a vert stack and running strict person to person defense. Cleveland, on the other hand, has been a team that owns the slop. On the surface, Cleveland’s run this weekend has largely been fueled by their athletic defense. With their season on the line, it was the team’s mentality that pushed them to come out firing . With twelve seniors leading the charge behind the playmaking of captain Amanze Oleru, Cleveland overwhelmed Iowa City in prequarters, jumping out on a 4-1 run to start the game and set the tone. “We came into the game ready to prove the team is ready to peak at nationals,” said Oleru after the game. Cleveland was able to draw on its history as an underdog and it’s nothing-to-lose mentality to battle its way into quarters. Their path gets much tougher tomorrow when they face Catholic, clearly one of the toughest teams from Saturday. After a poor showing to start the weekend, Center Grove picked back up and looked again like one of the nation’s top teams. In their final three games of the day, Center Grove won by a combined score of 38-14. For any high school program with a roster of only fourteen players, the prospect of a national title is almost unbelievable. Lakeside isn’t just any high school program, however. They dominated their opening round game against Iowa City and locked up a bye into quarters with a close win over Holy Family. Their Sunday position locks them in as a favorite to make a run to the finals, capping off a great season that included a Washington state title. They’ve accomplished this without the consistent presence of their coach Luke Johnson (who currently resides in North Carolina) and, once again, fielding a roster of only 14 players. For Lakeside, the players powering their success are seniors Ben Lewis and John Randolph (Seattle Cascades, Junior Worlds). Lewis has been hard to stop in the backfield and showed a willingness to take every pass against junk and zone sets. For Lakeside, as with many programs out of the Northwest, the National Invite is a prime opportunity to test themselves against teams they rarely see during the spring. For Lakeside to succeed on Sunday they will need to carefully manage legs while knowing when to ride their stars. So far their efforts have paid off. Sunday will be a true test for their small but very talented roster. In a wild day in Rockford, the Boys’ Division saw a handful of big (and almost) comebacks. In the prequarters matchup between Center Grove and South Eugene, Center Grove fell behind early. Thanks to big plays and tight defense by South Eugene, Center Grove struggled to get their footing. With two quick breaks, South Eugene pulled ahead for a 4-1 lead. Clearly scuffling, Center Grove called a timeout to gather themselves. Immediately following the timeout, Center Grove took off. A 12-2 “run” ended the game and looked effortless for the Center Grove D-line. Center Grove went on to win the game 13-6. Also in prequarters, we saw a back and forth matchup between Garfield and Neuqua Valley. In a game of runs, Garfield got the final run, which gave them the win. After Garfield took a 5-3 lead, Neuqua Valley came roaring back with a surge of their own, taking a 7-6 lead into halftime. With scores going back and forth, Garfield made a handful of big plays late. Layouts and big deep plays gave tremendous sideline energy to Garfield, and they went on a 4-1 run to finish off the game. Throughout the year, Mason has seemed just a step behind many of the top-level teams across the country. 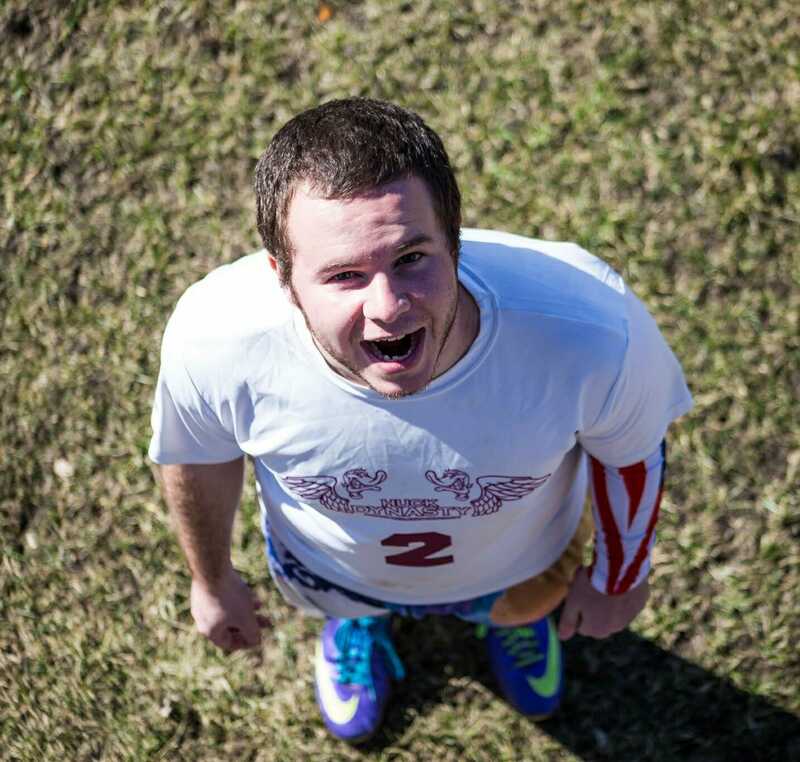 Coming into the tournament #23 on the Ultiworld Power Rankings, Mason was seen by many as a bit of an afterthought. Mason, however, had played close with #1 ranked Center Grove, losing by just one at Neuqua Knockout and two at Rivertown Throwdown. Heating up recently, Mason won the Ohio State Championships in thrilling fashion, and finally seems ready to be considered as a top-level team in the division. In the opening game of the day, Mason finally knocked off Center Grove. Mason came out with fire and energy early, taking a quick 4-2 lead over Center Grove, and never really looking back. Mason fueled themselves with energy and athleticism from everyone on the field. Mason closed out a dominant win, 13-7. Their energy carried them through pool play and into a quarterfinals appearance. With a game against perennial powerhouse and in-state rival Holy Family Catholic waiting, it is a great chance for Mason to prove themselves on the national stage. The three teams from Seattle (Lakeside, Cleveland, an Garfield) had a strong showing today, as they all qualified for the quarterfinals. With the west-coast teams playing their competitive season in the Fall, some questioned how they would look after going months without serious high school competition. It has been over six months since some of these teams have played meaningful games. Lakeside was the clear standout, really only being tested by Holy Family Catholic during pool play. They showed they were a step above much of the competition at the tournament. Cleveland and Garfield, despite slower starts, knocked off the rust and made some big plays to push through prequarters and into the Championship bracket on Sunday. With lots of talent on each of the rosters, the Seattle teams are ready to play in big games. Comments on "High School National Invite 2017: Boys’ Day One Recap"